The NFL’s real preseason started in earnest this past weekend (I refuse to recognize the legitimacy of the Hall of Fame Game), and with the first set of games in the books, we’re here to sling around the latest football news. Andrew Luck’s NFL career sort of began on Sunday, and now we will forever get to hear that Andrew Luck’s first pass was a 63-yard touchdown. In reality, Andrew Luck’s first pass was a three-yard shovel pass and 60-yard run by Donald Brown (the latter of these being far more surprising), but even with that, Luck looked excellent. The highlight wasn’t Brown’s score or even Luck’s second touchdown throw, but rather a deep, deep out to fellow rookie T.Y. Hilton on the left sideline. 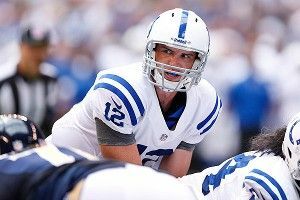 Luck’s decision making, poise, and athleticism all looked as advertised, but on the toughest throw there is, the velocity on Luck’s ball was a telling answer to questions about his arm strength. Many of the biggest names on the Chicago Bears missed Thursday’s preseason game against the Colts Broncos — Julius Peppers (field conditions), Matt Forte (ditto), Jay Cutler (fatherhood) — but the only one whose absence has people worried is Urlacher. The 13-year veteran reiterated yesterday that missing the game and the team’s past two days of training camp were due to a personal matter and not about the concerns surrounding the health of the left knee he injured in last season’s finale. Urlacher has said his health come Week 1 is his only concern, and for a player who’s been in charge of the same defensive system for nearly a decade, missing a few training camp practices to get his body right isn’t all that troubling. Still, when the 34-year-old missed all of 2010 with a wrist injury, the Bears’ defense looked out of sorts, and if this is actually a team that’s set for a Super Bowl run, the man in the middle will need to be a part of it. 3. What’s the deal with rookie quarterbacks? It seems like Cam Newton and Andy Dalton might have started something. As college (and high school) offenses get more pass-heavy, quarterbacks are walking into the NFL more pro-ready than ever, and the latest crop of rookie quarterbacks did plenty to back up that theory in their first NFL action. Robert Griffin (4-for-6, 70 yards, TD), Russell Wilson (12-for-16, 124 yards, TD, INT), and Ryan Tannehill (14-for-21, 167 yards, TD) all joined Luck with solid outings in their first preseason games, and for Wilson and Tannehill — both of whom are engaged in quarterback battles heading into the season — it could be an early sign that each is more ready to start than some previously thought. With the news about David Garrard’s knee surgery, Tannehill and Moore will now spend the remainder of camp fighting to be the team’s Week 1 starter. In Seattle, the competition is between Wilson and free-agent pickup Matt Flynn, and plays like this can’t hurt Wilson’s chances. Even as recently as last season, the prospect of this many rookie starters just wouldn’t seem possible, but with Newton and Dalton playing the way they did last season, the risk seems to be smaller than ever.